Rema Tip Top Rim & Bead Sealer with Brush Cap BOWES RTC 960. 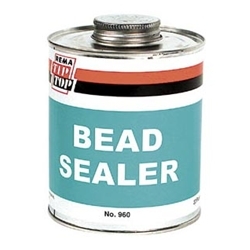 REMA TIP TOP offers two distinct Bead Sealer formulations designed to prevent leaks between the tire and rim. • Designed to be applied to tire beads during the mounting process. • Ideally suited for use with new or old tires. • No drip formula is highly viscous with an extended shelf life.